We pretty much had the beach to ourselves at times, which was fantastic. Unfortunately, this meant that whenever we’re outside, we always get approached by vendors selling their wares or pedicab drivers asking if we want a ride. Sta. Fe is quite small, and we were able to walk anywhere. The only time a ride was required was on trips to the Bantayan town proper, and to the Sta. Fe Port. What’s great about Sta. Fe is that you have easy access to fine white sand beaches that is not crowded, have access to restaurants with good pizza, yet it still remaining a small sleepy town. 3 Tricycles costs Php 25 per person from Sta. Fe to Bantayan town proper. On our last pedicab ride to the port, our driver said that the standard price is Php 20 per person from Sta. Fe, we just gave him an extra Php 5 per person. 4 We rented a beachfront house through Airbnb. This comes out free, as I used the free credits I won in an Airbnb contest. Sign up using my referral code to get Php 1,000 credit! 5 This is a combination of carinderia food and restaurant meals. 6 Terminal fees at Hagnaya and Sta. Fe Port, gate pass at Sta. Fe Port for our pedicab, and a Php 2 fee to use the toilet at the bus’ stopover. If you take the 3am flight from Manila to Cebu, you’ll be able to catch the first bus to Hagnaya, which leaves at 5am. There is actually a Ceres bus that can take you from the Cebu North Bus Terminal all the way to Bantayan. It leaves Cebu at 00:30, 3:30, 10:30, and 12:30. These buses would also be making the return trip to Cebu. I don’t have the schedule, but there is one that leaves Bantayan town at 1:45 pm. The bus is parked in the town plaza, near the Bantayan Multi-purpose Center. To go to Bantayan town proper from Sta. Fe, walk to the main road (F. Roska St, C. Batiancila St., Bantayan-Sta. Fe Road), and hail a big tricycle. These are the ones that has a wider body and can seat up to 10 passengers. The fare is Php 25, and takes about 20 minutes. There is a market in Sta. Fe, but if you want cheaper prices, it’s better to buy from the public market in town. Caffe del Mar has really good pizza. On the way back to Cebu, a Ceres bus meets the ferry docking, so you can board a bus as soon as you get off the boat. It leaves as soon as the last ferry passenger has disembarked, but it will pick up passengers along the way. The bus ride between Cebu and Hagnaya takes about 3 hours. If you are flying out immediately after getting back to Cebu City, you can ask the conductor to let you off at Pacific Mall, Bridges Town Center, or Park Mall, to avoid the traffic in the area near SM and the North Bus Terminal. If you get off at Park Mall, do try Cebu’s Original Boneless Lechon Belly. SO GOOD. It’s just a small kiosk at the outdoor dining area. 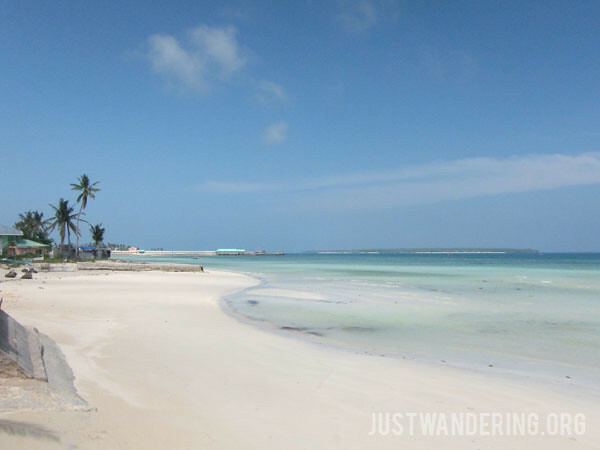 Bantayan Island looks so beautiful! I also discovered another cebu gem from reading http://www.tripmoba.com/Guide_Show.aspx?GuideID=64. Can’t wait to see this beautiful place next week! Having the beach to yourself is just pure paradise. you get to enjoy the beaches without the crowd which is (I think) the best feeling in the world. white beach is perfect to relax, and got to see that crystal water beach after a long walk in the bush cant remeber the name, the mangrove and the small cave, impressive! I’m planning for a solo trip to Bantayan Island. Your notes are really helpful. Thank you! I’m glad it helped! Enjoy Bantayan! It’s a really beautiful destination. Such a helpful post. With breakdown of expenses, it helps me calculate how much I should bring should I visit this place. Would you happen to know how much it would cost me if I rent a scooter or motorbike so I can travel on my own from Sta Fe port to Bantayan town? And do you have any suggestions on where I can rent one? I am planning to visit Bantayan Island next month and this information would help me finalize my budget. Sorry Carl, I don’t know where you can rent motorbikes in Sta. Fe. There are plenty of people around the pier when the boat docks, so you can ask around. The rent would probably range between Php 300-1,000 per day. I was in Bantayan for about a week in May. My Girlfriend and I rented a scooter for 350 php. That was for a 24 hour period. We asked the guy on a tricycle who gave us a ride to the resort we were staying at. He even delivered the scooter to us. The same guy also helped us plan a day of island hopping on his uncles pumpboat and they cooked us food on Virgin Island that we got at the marked that morning. That cost 1500 php but we gave 300 php for a tip. I hope this helps. If you have any other questions I would be happy to answer if possible. I had an amazing time in Bantayan. Do you have the contact number of the guy who took you to an island hopping tour? Also, which resort did you stay at in Bantayan? I will be in Cebu in August and I’m starting to plan my itinerary. Hi Anna, mahirap ma-tantya kung kelan dadating ang bagyo. Ayan ang risk kapag mag travel during the rainy season. Hi is this still accurate? I tried looking for other references but can’t find any. Hi, I do not live in Bantayan, and I have not visite recently, so I’m not sure if it’s still accurate. If you have already booked an accommodation in the island, I suggest you inquire with your guesthouse/resort. Hello. Have you been in Moalboal? There are also beautiful beaches there. Surely you’ll like it.